Cramped in a middle seat, in the middle of a plane that screams its way across the country, traveling east to west from Washington D.C. to “the other Washington”, I find myself in the warm company of happy Democrats. Across the aisle are the Governor and First Lady of my state. Six rows up is the Executive of King County in Washington. And peppered throughout the seats are delegates, donors, staffers, movers, shakers, and constituents who flew to our nation’s capital to celebrate the beginning of the second term of our 44th president. As we make our way home, like our counterparts from the other 49 states, we’re still basking in the afterglow of four days of banquets, balls, private parties, parades, and the third largest inaugural ceremony in our country’s history. This weekend was, to be sure, a Liberal Lovefest. Except for the obligatory appearances of certain representatives and senators, I’m pretty sure that the crowds that stood shoulder-to-shoulder to cascade down the steps of the Capitol, to fill the National Mall, to line the streets, and to shout cheers of elation and appreciation were all partying for the same party. Still, for all the partisan camaraderie, a grander sense of solidarity rippled through this political Mecca, stirring in me a deep-seated pride and love of country. Giving the green light to congress to work in harmony at the Capitol. On our first night in town, Rick and I bundled ourselves up to brave the January chill for a moonlit visit of our national monuments. 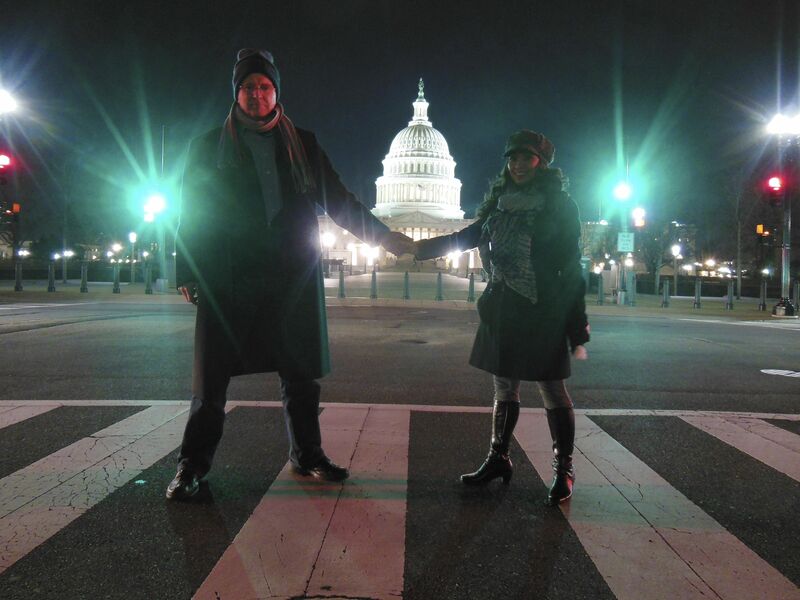 Although not truly a monument, we began at the Capitol. We marveled that this tribute to Democracy was so easily accessible to us and to every person who chooses to visit it, but we were delighted that on this night, we had the place virtually to ourselves. We had read about President Lincoln’s determination to complete the construction of the dome during the Civil War as a testament to the notion of maintaining our young nation’s unity. He said, “If people see the Capitol is going on, it is a sign we intend this Union shall go on.” Despite all the turmoil that inundates this home to our legislators, the Capitol stands as reminder of what we as a country have worked so hard to achieve and what we empower our representatives to accomplish for the benefit of all our countrymen. Compelled by this thought, I gazed teary-eyed at the cupola, which glowed brightly beneath a velvety onyx sky. Just being in the presence of this historic building was enough to restore all faith in my country. My pride soared and my hope grew strong, and I wanted so desperately to share this moment with everyone. Thomas Jefferson: Founding Father, author of the Declaration of Independence, third president of the U.S., great citizen and leader. Each of the memorials we visited obliged us to reflect carefully on our history and the values we embrace as Americans. It was clear that the designers and architects of these commemorative testaments thought carefully of how best to personify the great feats and triumphs of these mere mortals who led our country through harrowing times. 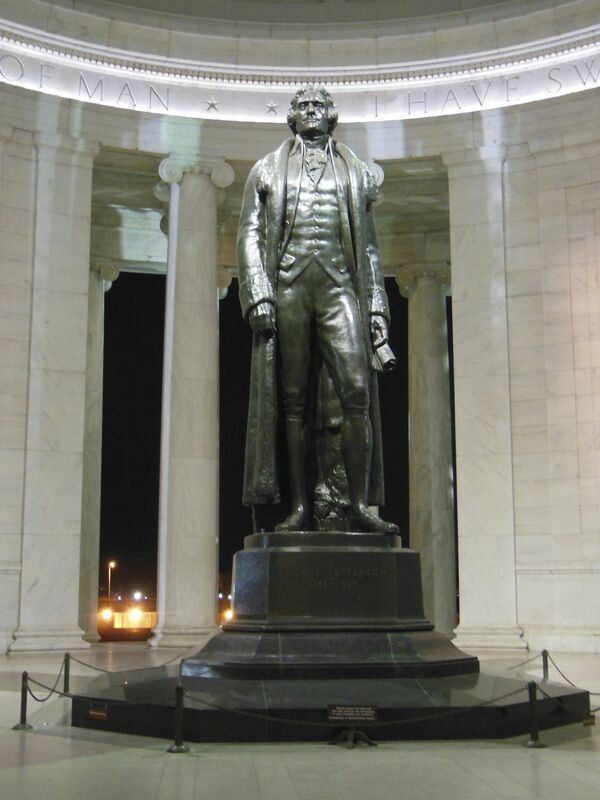 The Jefferson Memorial, in its elegant simplicity, properly honors our third president, with his wise counsel engraved onto the walls that encircle a stately statue of the principle author of our Declaration of Independence. As I stood next to his likeness, barely tall enough to reach the pedestal upon which it stands, I thought how fitting it is to truly look up to this man. Words of wisdom from FDR. The Franklin Delano Roosevelt Memorial, rife with symbolism, is as expansive as the accomplishments of his four terms as president. Abundant waterfalls, strong yet limber trees, and FDR’s sage words carved in granite all reflect his respect for the “Common Man” and the generosity, compassion, and wisdom that he shared with our country. I considered how FDR navigated our nation through the Depression and World War II. He propelled us forward with programs under the New Deal (such as Social Security, the Civilian Conservation Corps, the Farm Security Administration, the Works Progress Administration, the Public Works Administration, and the Federal Deposit Insurance Corporation) to combat poverty and unemployment, to re-establish and ensure economic security, and to support cultural prosperity. 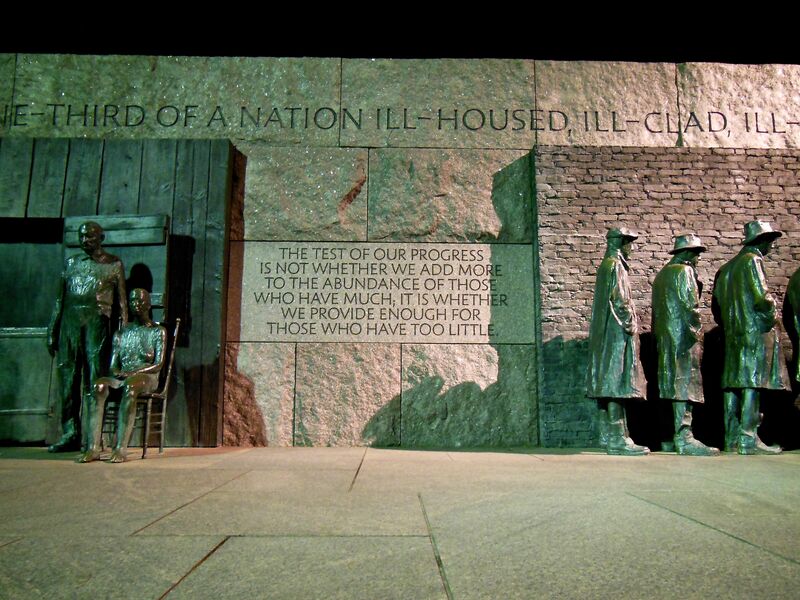 I can hardly imagine where we would be today if not for FDR’s visionary leadership. And I’m grateful that in protecting those who needed help the most, Roosevelt created a model of American leadership that people across the globe strive to follow to this day. Abraham Lincoln–the embodiment of action, equality, and justice. 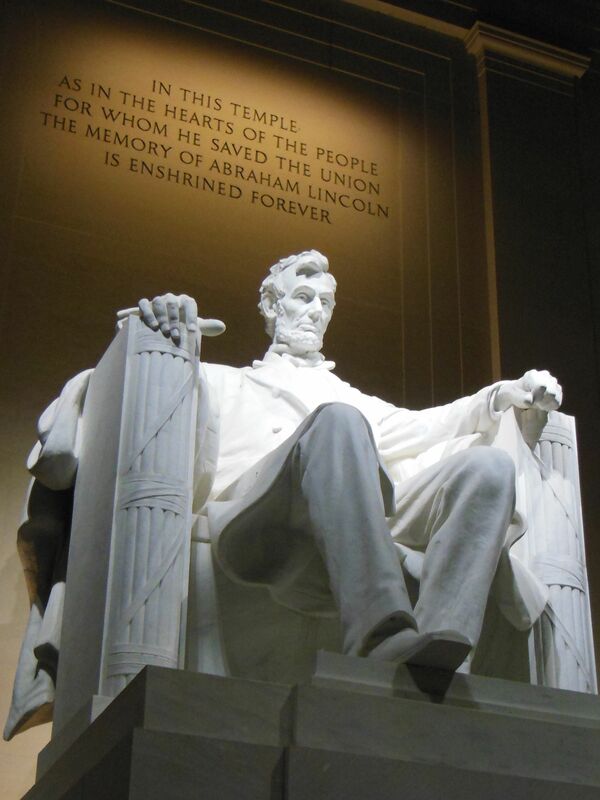 Inside a pantheon-like shrine, a marble Abraham Lincoln sits stoically dignified. His soft-spoken nature and resolute commitment to action are both manifest in this sculpture. The Gettysburg Address and Lincoln’s speech from his second inauguration flank the president and remind the visitor of the difficult challenges our country faced at the time and how the people, then and now, must always strive for what is right, what is just, and what is good for the whole of the country. With one foot forward, as if ready to rise to action, I felt Lincoln compelling me not to be a mere spectator to our Democracy, but to be fully engaged in it. It is up to us to continue the work of MLK and the great leaders of our country who came before us. 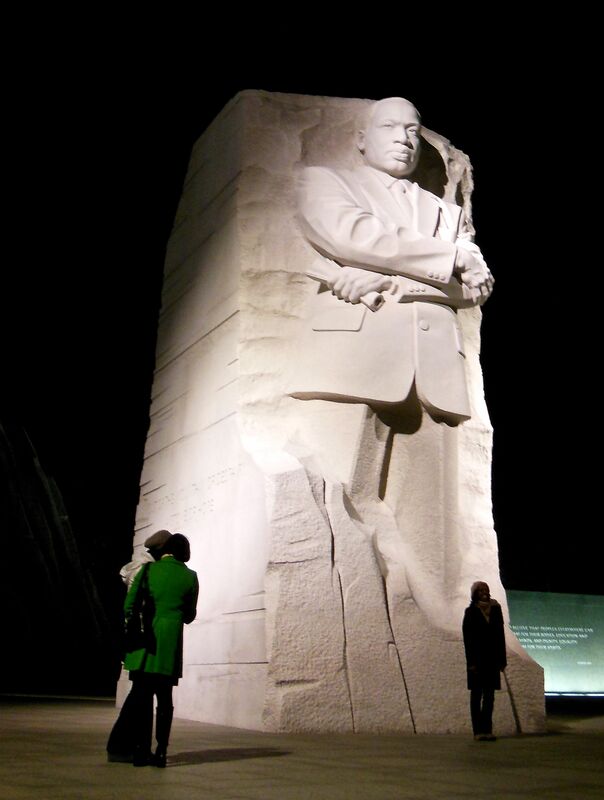 The newest monument is the Martin Luther King, Jr. Memorial. Like outstretched arms, an unbroken wall arcs around the dignified sculpture of the greatest Civil Rights activist and offers words of love, peace, and hope that ring as true today as they did four decades ago. They serve not as a call to arms, but as a call to compassion and equality for all. Yet even the statue, carved as though MLK were emerging from a singular block of granite, reminds us of the unfinished work and unresolved struggles that we, the beneficiaries of his efforts, have yet to overcome: injustices that must be rectified, inequalities that still permeate our society, and prejudices that still simmer in the melting pot of our great nation. Hope for change must live on in us. And it is through us and through our belief in our nation’s most fundamental ideals that change will continue to come. Great leadership, great citizenship, great governance, and great works. At every turn, Washington D.C. provides beautiful ways for our citizenry to engage in its history and our democracy. And on this weekend, there was none greater than the Inaugural Ceremony and the Inaugural Parade. Rick and I were fortunate enough to acquire ticketed seats for both events. 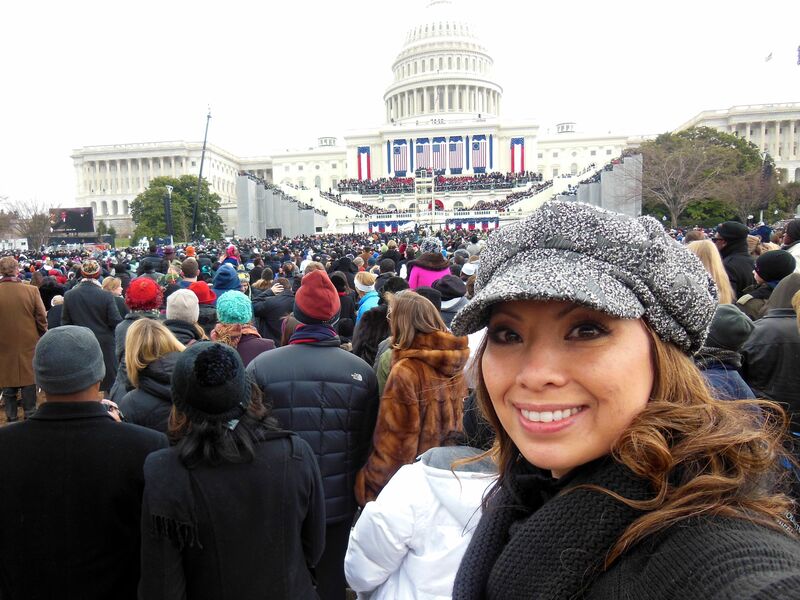 So thankful to be here for the second inauguration of President Barack Obama. Cloaked in seven layers of clothing and a blanket borrowed from our hotel, I shivered next to Rick as we faced the West Portico of the Capitol. We weren’t close enough to see the President clearly without the help of Jumbotrons, but we were close enough to feel pretty darn lucky. In front of us on the steps of the Capitol, bleachers were erected for prominent government officials and special guests who were fortunate enough to be thisclose to the President for his swearing-in. Behind us, the masses huddled together for 1.5 miles back to the Washington Monument, relentlessly waving innumerable flags in patriotic solidarity…or perhaps just to stay warm. From the steps of Capitol Hill to the base of the Washington Monument, we gathered to celebrate our history and our future. As my focus shifted throughout the ceremony from the President’s emotionally (and politically) charged speech to my fellow Americans who shouted in unison for our political heroes, I kept saying to myself, “I feel the love.” This wasn’t a fanatical love for “our team” based on adversarial animosity against the other side. This was a universal love of country that, no matter what political viewpoint you champion, fills us all. Because of this trip to Washington DC, I have great and renewed faith that we all want and hope for the best for all citizens of our nation. And while we may go about expressing, supporting, or enacting that in different ways, it is that love of country–intertwined with our shared history, our common legacy, our national pride, and our faith in our Democracy–that keeps the dream of America strong. The fervor at the Inaugural Parade reinforced that. Despite starting nearly two hours late, the parade amplified everyone’s excitement. We sat giddily hip-to-hip with Americans of every creed, color, and orientation. Across the way, the sidewalk was packed from street to building with energetic families, and in the windows of the stores, restaurants, offices, and apartments, people pressed their noses to the glass and scanned up and down the streets for any signs of spectacle. 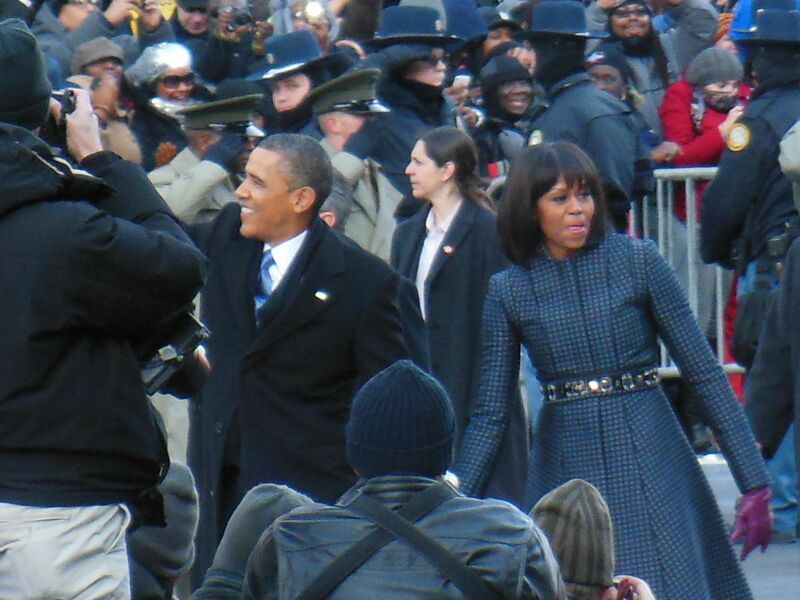 We were only twenty-five yards away from President Barack Obama and First Lady Michelle Obama as they walked down Pennsylvania Avenue, and I could swear they looked at every single one of us in gratitude. We are the descendants of generations of Americans who, over the course of nearly 250 years, have welcomed, celebrated, and supported 44 fellow citizens as they stepped into the role of President of the United States of America. Our history holds us together, and it is what we must do in the present that will keep our country together throughout our future. 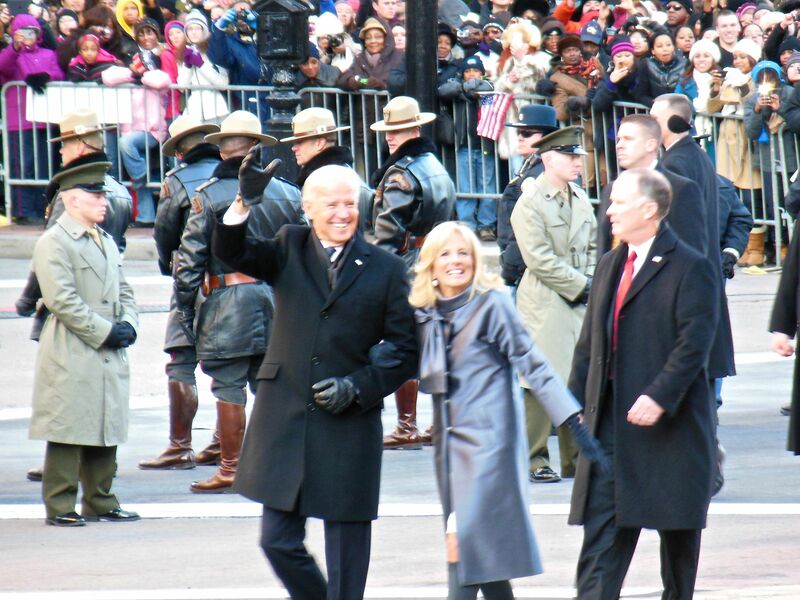 Bonus photo: Vice-president Joe Biden and Dr. Jill Biden. Regardless of party affiliation, no one can deny that this was an historic event: the commencement of the second term of the first Black American president. We’ve come a long way since our forefathers fought for independence from a royal government across the sea. It is because of their vision that we have the right and responsibility to govern ourselves with the best interests of the people in mind and that we continue–if only in fits and spurts–to move forward in becoming “a more perfect union”. I love your posts. You are a terrific story teller. Thanks for your fresh view of a wonderful day. 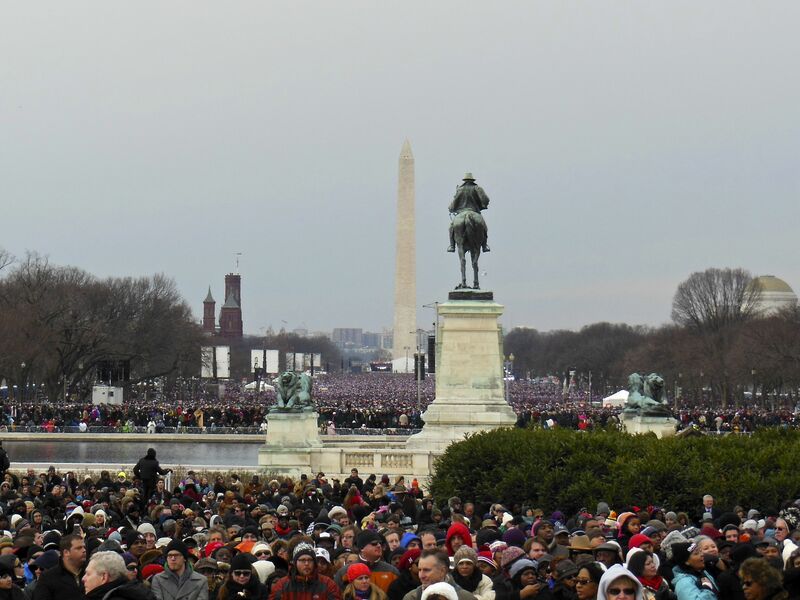 Every inaugural is a reminder that we, as a nation, often divided, continue to rise above our differences to achieve the best – and hopefully guide others to be open to the beliefs and differences in society so that one day… how ever far in the future, will be one nation….mankind. Thanks for your heartfelt view. Sorry to sound like such a dreamer but I really believe that travel and sharing will make us a smaller world – one world nation. P.S. Isn’t being part of history fun??? Hi, Renee. Thank you for for reading this post and for your kind words. Your remarks about the inauguration and about traveling are spot-on. I don’t think you sound like a dreamer, rather an optimist who believes in the potential of mankind…and that is a beautiful thing. Inspiring post, and I especially like the final photo! Thanks, Trish! Thanks, Leslie. The first and last are my faves. I’m always grateful when YOU like on of my photos. Kat, you are so kind to say that! Thank you! Have a marvelous time in DC. I’m hoping to be back there again in March for a brief weekend trip, but if you have tips you’d love to share, please let me know. Take care!